The BEST Comedy ENGLISH THEATRE in TOWN! SOLD OUT in July ! Dont Miss Us ! The Return of the English Theatre Episodes from the last series of Rowan Atkinson’s famous comedy. Hit production, comedy theatre in English. Mike’s Badhuistheater has done it again. Don’t miss the new episodes in part 2. Captain Blackadder, Baldrick, George and the Red Baron fly in the skies! The actors will present themselves to the audience after the show. We will discuss, drink and tell cunning tales 🙂 The first shows were totally sold out. All of the characters are still stuck in the Flanders mud, ready to die for king and… what was it? The Brilliant boys and girls of Mike’s B(M)ADhouse are going to make you happy with their tragic deaths in part 2. Hilarity guaranteed! In november it is a 100 years ago since the end of the terrible European World War. We all know what the consequenes were and are! Come and share and think together in our wonderful theatre. Blackadder Goes Forth is the fourth and final series of the BBC programme Blackadder, a black comedy about war in general, well known for Rowan Atkinson’s (Mr. Bean) portrayal of the character Blackadder. The writers of the series changed during the series, but together reached great heights in comedy language. Sometimes touching Restoration Comedy. 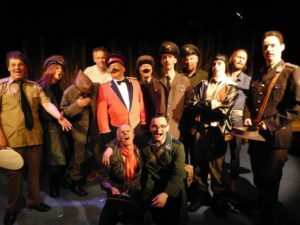 It is the same company, BadhuisInternational, that previously performed ‘Allo ‘Allo!, Entertaining Mr. Sloane and the Sean O’Casey Dublin Trilogy. 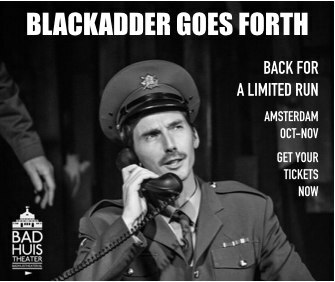 Blackadder Goes Forth is directed by Michael Manicardi. Mike’s Badhuistheater is an amphitheatre/old bathhouse that presents performing arts, music, dance and literature in a fun and social manner. There is plenty of room for international productions, and the ever-friendly atmosphere makes for a great night of culture.